Banners, flags, and garlands are not a new trend this year (they've been around for quite a while now), but manufacturers are starting to make it easier for the consumer to incorporate them into their projects with tools and pre-made banners, flag sets, and stitched garlands. I haven't seen this much navy blue in paper collections for years. And it's not just in the "boy" collections either. Most manufacturers have it in at least one of their collections. I often saw it paired with the Pantone color of the year, tangerine. Very cool. 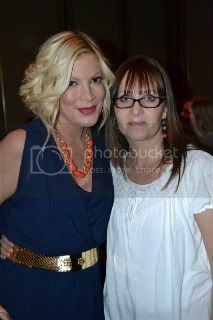 Tori Spelling thinks so too. Check out her navy dress and tangerine necklace! Cool new tools: Imaginisce i-magicut ribbon cutter cuts angle and dove tail ends AND heat seals them too so they don't fray. Awesome. Inkadinkadoo (EK Success) is releasing stamping templates that allow you to stamp a border in a circle or oval, on a full 12x12 sheet as well as on cards. Love it! Adhesives: Therm-O-Web is releasing Glitter Dust (almost transparent glitter spray in an aerosol can) and iCraft--a thin double sided adhesive available in sheets, dots, and tape. You can run the sheets through a Silhouette machine, apply the die cut shape or title to your project, and then cover it with glitter, flocking, tinsel, microbeads, etc. Very cool! Innovation: EK Success, through it's Martha Stewart brand, is releasing Crafter's Clay and Molds. Crafter's Clay is an air dry clay that is as light as paper, extremely soft and smooth, and can be molded, sculpted, painted, or covered with glitter. The end result is an embellishment you can use on papercrafts, jewelry, or home decor items. It kind of reminds me of the old paper molding, but it's much more smooth and totally feels and acts like clay. Amazing what their designers made with it! I saw quite a bit of this starting CHA winter 2011, but more and more companies are diversifying their product lines and expanding to include fabric, jewelry, embroidery, iron-on transfers, etc. More and more manufacturers are also collaborating with each other and co-branding stamps, dies, and other products to match their paper lines. Well, that it folks! Now we've got a whole 6 months to enjoy these amazing products before we have another bunch to drool over. I don't think my craft room can take much more of this...hee hee!